Designer dogs have become increasingly popular in recent years, thanks to stars such as Paris Hilton, Mischa Barton, Jake Gyllenhaal, and Jessica Simpson who all own designer breeds. These designer dogs, or hybrid dogs, are created by carefully crossing two distinctive breeds and birthing a litter of unique, healthy and happy puppies. At Toy Puppies by Myra, I take time in carefully selecting prospective parents to ensure that the best traits of both breeds will shine through in the litter of hybrid puppies. If you are considering obtaining a designer dog, then it is important that you ensure that you are working with a trusted and experienced breeder. I evaluate each of my breeders for sound genetics and most of all good temperament. I want to produce a hybrid that has the best attributes of both parents. When you work with Myra, you know that you will be receiving a Bichon hybrid that has been carefully selected for genetics and temperament. 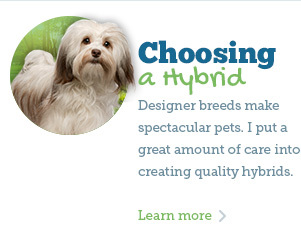 Designer dogs should be considered "improvements" to the traits of each parent and not just be bred for a mix. There are various organizations that recognize hybrid dogs, such as the American Canine Hybrid Club. Hybrid dogs have been known to be healthier than some purebred dogs because the mix of two breeds can greatly eliminate genetic disorders found in purebreds. 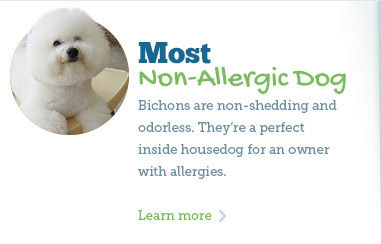 Bichon hybrids are beautiful, well-tempered and loving. Hybrids I specialize in include: Teddy Bears (Bichon/Shih Tzu) Marshmellows (Maltese/Shih Tzu) some Morkies (Yorkie/Maltese) and some Poos. My aim is to ensure that all of my hybrid puppies are not only beautiful and loving companions to your family, but also that they are healthy and temperamentally sound. Each litter is unique and different, which means that your puppy will be in a class of its own. I rely on the feedback that my clients provide me to ensure that each litter lives up to my standards. If the feedback pertaining to a litter is good, then I may repeat the same cross the following breeding year. 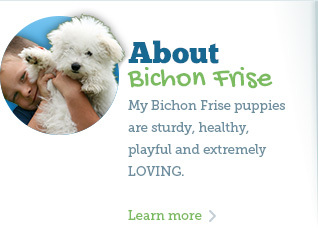 If you are interested in owning a beautiful Bichon Frise hybrid, do not hesitate to contact a Fort Lauderdale hybrid breeder at Toy Puppies by Myra and check availability of these litters. I look forward to working with you and helping you choose the best puppy for your family.